The Courtyard Anaheim Theme Park Entrance is the perfect choice for your Disneyland vacation! 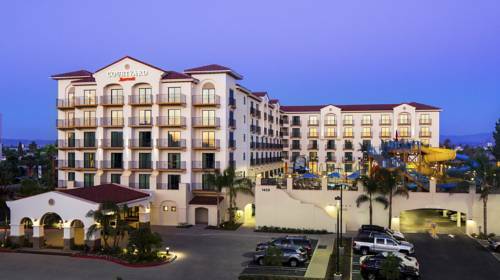 Located on South Harbor Boulevard in Anaheim, our hotel is just a five-minute walk from the entrance to the parks. Cool off at our Surfside Waterpark, which features 30-foot water slides, a 400-gallon drench bucket, swimming pool, kid's pool, and mesmerizing views of the Disneyland fireworks display. Our rooms offer over 530 square feet of space and twin bunk beds, and can accommodate up to six people. Enjoy superb amenities such as free high-speed Wi-Fi, flat-screen LCD televisions, and Netflix streaming capability in every room. Indulge in delicious dining at The Bistro, or satisfy any craving with a wide variety of food, beer and wine options all from the comfort of your hotel. You'll also enjoy access to our state-of-the-art LIFE FITNESS Center. We invite your family to join us on here in the front row, and to experience the ultimate Disneyland getaway at our custom, family-friendly Courtyard. Located in the lobby, find refreshing breakfast choices in the morning, and a variety of dinner, beer and wine options in the evening. The Bistro also offers specialty beverages made with Starbucks coffee! Open 6:30AM - 10:00AM & 5PM-10PM daily. The Terrace provides the perfect setting to unwind after a day of fun. Kick back with a cold beer or a glass of wine around our fire pit, or catch the evening fireworks display from the best seat in the house on our restaurant's sidewalk patio. Whether you're stocking up for your family trip to Disneyland or satisfying late-night urges, The Market is open 24/7. We offer a wide variety of grab-and-go snacks, beverages, and sundries to make sure you're ready for your Anaheim adventure. Jump-start your morning with your favorite Starbucks beverage, conveniently located in our hotel lobby at The Bistro. Stop in and grab a specialty coffee drink or a quick breakfast. Featuring a diverse menu that specializes in French-inspired comfort food, Mimi's Caf offers another excellent place to eat near Disneyland .